What it's about: Three lands divided, not just by fences, but by religion and history as well, in this fantasy where magic lies underneath the surface. With an array of main characters and intertwining lives and events, this story will transport you to a completely different world. 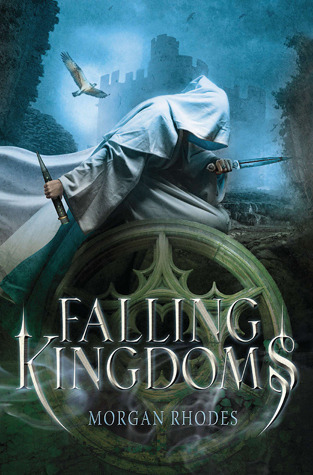 What I thought: Falling Kingdoms started off slowly for me, but by the end it had completely enraptured me. I was immersed into this fantasy world, where nothing is as it seems. While the vivid descriptions of the lands and palaces were something to gawk at, the characters are what stole the show for me. There are the main characters and of course, the supporting ones too and you just can't help but love them all equally. While Falling Kingdoms was riddled with twists, I found most of them to be obvious almost straight away. Falling Kingdoms is an amazing start to what I can tell will be an intense series. The Good: Having so many new characters to love, and trying to figure out which ones will be your favourites! The Bad: *Spoiler alert* Having so many characters you really like get killed off in the first book! Nooooooo! Great review! I just got this from the library and I hope to enjoy it as much as you. It was slow for me in the beginning too, and I didn't think the world was that original but I did enjoy the characters and I'm curious to see what happens to them next in the sequel. Hi Claire. I don't read much fantasy, but am beyond interested in Falling Kingdoms. I have to at least read this first installment and go from there. I have had the pleasure of enjoying many books that are out of my comfort zone and am hoping that this will be one of them. Thanks for your great review. Oh, I love characters! If a book doesn't have great characters, then it's just hopeless for me. So happy you liked it and now I can't wait to read this even more. Great review!